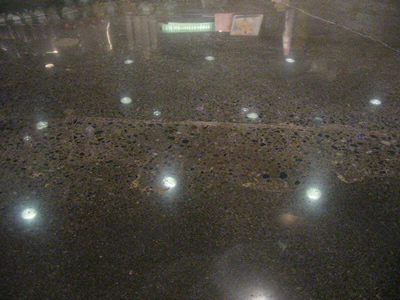 The reflectivity of a polished concrete floor reduces the amount of lighting needed to sufficiently illuminate a space. The light reflectivity applied in an industrial setting can create a work area more efficient and productive to work in. A large dark shadowy workspace can become a light bright open space with a comfortable feel. Reflected light provides enhanced illumination for working under aircraft and other vehicles. It's easier to see and inspect your work and to find dropped parts.